An Innovative Collaboration to improve the health status of northern New Hampshire. Clean out your medicine cabinet for Drug Take Back Day on Saturday, April 27th! Clean out your medicine cabinet! Saturday, April 27th from 10 AM – 2 PM is National Drug Take Back Day and participating police departments throughout the North Country are calling on residents to drop off their expired, unused, and unwanted prescription medications to their local drop box located at the following police stations: Berlin, Bethlehem, Carroll, Colebrook, Gorham, Groveton, Haverhill, Lancaster, Littleton, Lisbon, and Whitefield. Accepted items for drop boxes at all locations are prescription drugs and over-the-counter medications. Illegal drugs, needles, lotions or liquids, inhalers, aerosol cans, thermometers, and hydrogen peroxide will not be accepted for collection. People depositing medications at drop box sites should keep medicines in their original containers and must be the prescription holder of the medicines for disposal. Twice a year across the country, the Drug Enforcement Administration (DEA) declares Prescription Drug Take Back Day. Leading up to each bi-annual Take Back event in April and October, prevention specialists and advocate groups across the state, meet at the DEA Manchester District Office to strategize for their respective regions. Representing the North Country, staff members from the North Country Health Consortium (NCHC)—including the regional Substance Misuse Prevention (SMP) Coordinator, Greg Williams, and Drug Free Community (DFC) Coordinator of the Haverhill Area Substance Misuse Prevention Coalition (HASMPC), Mariah Coulstring— joined other Prevention workers and advocates to plan for the upcoming April 27th Drug Take Back Day. Along with Take Back Day activities, other safe drug disposal initiatives that the group discussed include the Deterra® Drug Deactivation System, a drug disposal pouch provided by the Rx Abuse Leadership Initiative (ralinh.org), which gives people an easy method to deactivate and dispose of unused, expired or unneeded medications in their own home. "The state of NH together collected 11,880 pounds of unneeded medications during the last Drug Take Back Day in October, 2018," said Williams. "815 pounds of that came from the North Country. Let’s beat those numbers together, as a state and region!" For the 15th bi-annual National Prescription Drug Take Back Day on Saturday, April 27th from 10 AM – 2 PM, community members are encouraged to deposit their unwanted and expired prescription and over-the-counter medications at a participating North Country police station: Berlin, Bethlehem, Carroll, Colebrook, Gorham, Groveton, Haverhill, Lancaster, Littleton, Lisbon, and Whitefield. Leading Up to National Prescription Drug Take Back Day on Saturday, April 27, 2019, North Country Health Consortium (NCHC) staff members, Mariah Coulstring (left), Drug Free Community (DFC) Coordinator of the Haverhill Area Substance Misuse Prevention Coalition (HASMPC), and Greg Williams (right), regional Substance Misuse Prevention (SMP) Coordinator, met at the Drug Enforcement Administration (DEA) Manchester District Office to strategize with other prevention specialists throughout the state for the bi-annual initiative. 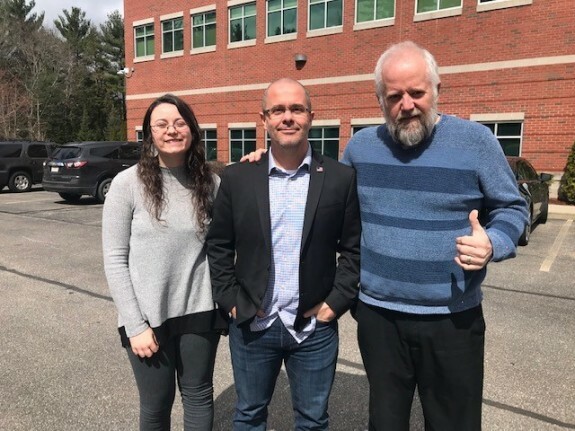 Mariah and Greg are pictured in front of the DEA, Manchester with DEA Special Agent overseeing the state of New Hampshire, Jon DeLena. Submit your SUD recovery story for the #NorthCountrySpeaksRecovery Video Project! Are you in recovery? Are you inspired to share your substance use disorder recovery story? 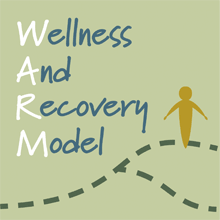 North Country Health Consortium's Wellness And Recovery Model (WARM) is requesting video submissions for #NorthCountrySpeaksRecovery, a project that aims to reduce stigma, create a unified recovery voice in the North Country, and empower individuals in recovery to speak out. 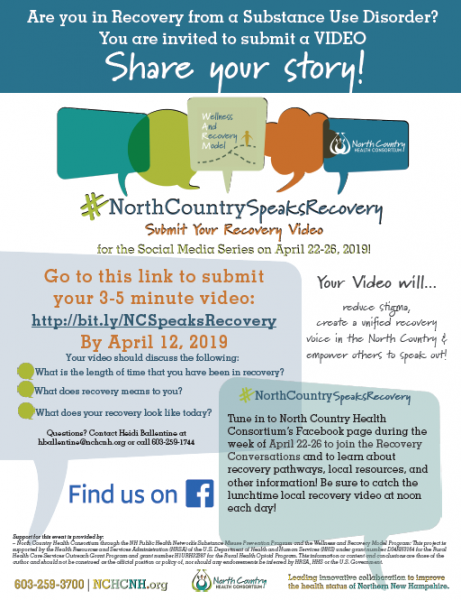 Your video could be featured in the #NorthCountrySpeaksRecovery Social Media series during the week of April 22-26 on North Country Health Consortium’s Facebook page! The focus of your video should be on personal recovery and not addiction. Know someone with an inspiring recovery journey? Click the following link to share the #NorthCountrySpeaksRecovery Video project flyer and encourage them to submit a video. Visit North Country Health Consortium’s Facebook page during the week of April 22-26 to tune in to #NorthCouintrySpeaksRecovery and join the Recovery Conversation, learn about recovery pathways, local resources, and other information! BERLIN – Don’t be alarmed if you see several local police cars, fire trucks, and NH State vehicles steering through town on Saturday, April 13th, and gathering at Berlin High School. There will be an exercise (drill) taking place to test and improve the Berlin region’s overall preparedness for an emergency event. The exercise is fictional and will simulate a bio-terrorism event requiring Berlin area residents to receive antibiotics. The scope of this initiative is a collaborative effort between several organizations from the local and state levels, including: City of Berlin (Emergency Management, SAU 3, and Police and Fire Departments etc. ); the towns of Gorham and Milan; North Country Public Health Network – North Country Health Consortium; NH Department of Health and Human Services; and NH Division of Homeland Security and Emergency Management. In the event of an actual public health emergency that would require providing protective medications or vaccinations to residents, regional dispensing clinics, known as “PODs,” would be open to area residents. The exercise on April 13th will run and test the Berlin region’s POD, which is located at Berlin High School. During the drill, medical and emergency personnel, volunteers, and other staff will simulate receiving and providing antibiotics. The incident is not real; however, response activities during the fictional exercise will be practiced in a manner that is as realistic as possible. 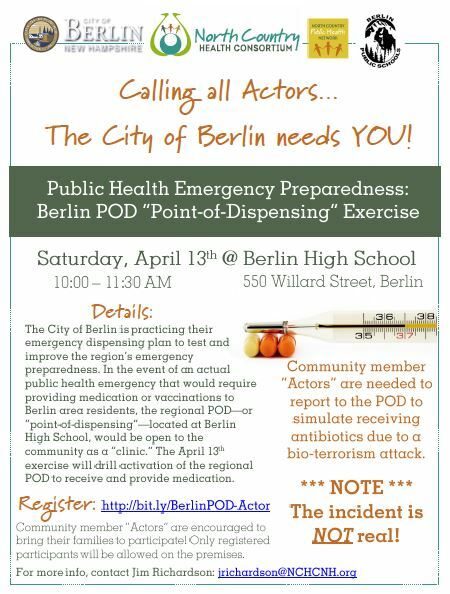 View Official Public Announcement Letter for the Berlin POD Exercise on April 13th by visiting the City of Berlin's website. February is National Children’s Dental Health Month! The month-long health observance is underway to raise awareness about the importance of adopting good oral hygiene habits for kids. Molar Express, a portable dental program of the North Country Health Consortium (NCHC), has kicked off a new Early Intervention Project that focuses on children through age five. 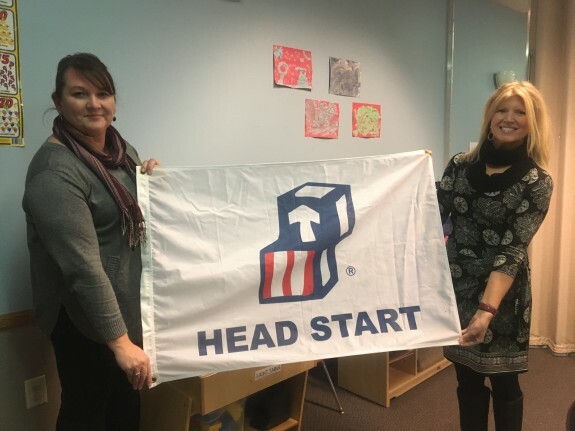 Thanks to a generous grant from the New Hampshire Children’s Health Foundation, Molar Express adds pre-schools and Head Start programs to its roster with locations throughout Coos and Northern Grafton Counties including, Colebrook, Groveton, Whitefield, Littleton, and Woodsville. "Despite the fact that it’s almost entirely preventable, tooth decay is the most common chronic disease in children," said Molar Express Certified Public Health Dental Hygienist, Annette Cole. "It can begin as soon as a baby gets his or her first tooth, so caring for baby teeth needs to begin before the first tooth arrives. The Molar Express Early Intervention Program is partnering with dedicated professionals at pre-schools and Head Starts to promote the benefits of good oral health to children, their caregivers, and teachers." This month, Molar Express begins services and referrals for children and education services for pre-school and Head Start parents. With portable state-of-the-art dental equipment in tow, the Dental Hygienist offers preventive services—including screenings, fluoride varnish, and decay-stopping fluoride treatment—and referrals to dental homes for continued care. Since 2004, Molar Express has been providing oral health care to North Country residents, and currently serves 20 schools (K-12), in addition to the newly added pre-school and Head Start sites. The North Country Health Consortium is a non-profit public health organization based in Littleton that collaborates with health and human services providers serving northern New Hampshire. 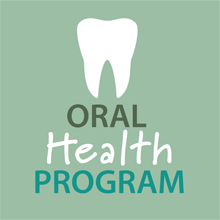 For more information about NCHC’s Oral Health programming, Molar Express and other NCHC programs, visit: www.NCHCNH.org or call: (603)259-3700. The North Country Health Consortium (NCHC) is offering free training to community members in bleeding control principles, so individuals are able to provide immediate life-saving aid in emergencies until first responders arrive. 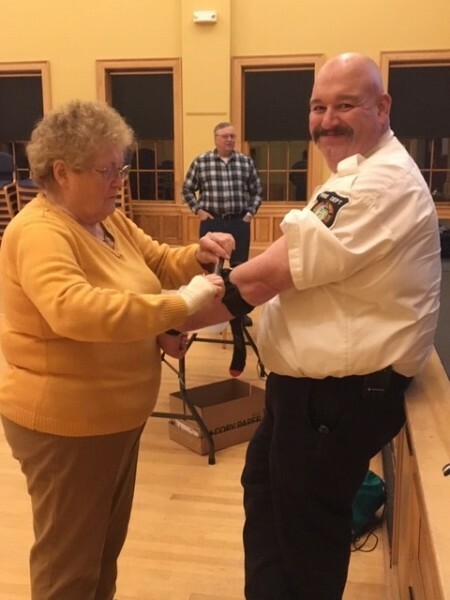 Upon completion, participants of the Bleeding Control Basic Course each receive a complimentary "Stop the Bleed" kit, which includes a Combat Application Tourniquet—or "C-A-T"— shears, and bandages, thanks to a generous donation from the Mascoma Savings Bank. "This training is invaluable for groups such as, school administration/personnel, snowmobile or hiking clubs, worksites, childcare facilities, and anyone who may find themselves in an emergency bleeding scenario," said NCHC’s Public Health Emergency Preparedness (PHEP) Coordinator for the North Country, Jim Richardson. Uncontrolled bleeding is the number one cause of preventable death from trauma. No matter how quickly emergency responders arrive, help given by an immediate responder—or a bystander present at the accident scene who can initiate bleeding control right away— will always be first, often making the difference between life and death. The "Stop the Bleed" agenda includes the Primary Principals of Immediate Response, which covers the "A-B-C’s of Bleeding": Alerting emergency responders by calling 9-1-1; Locating the Bleeding injury and recognizing when it is life-threatening; and applying a Compress, or other means of pressure, such as a tourniquet, to stop bleeding. To bring "Stop the Bleed" to your organization located in the North Country, contact NCHC PHEP Coordinator, Jim Richardson: jrichardson@NCHCNH.org or (603)259-3700 x255. Richardson is also available to work with community leaders to train the trainer in "Stop the Bleed" in order to encourage sustainability of the program. The North Country Health Consortium is a non-profit public health organization based in Littleton that collaborates with health and human services providers serving northern New Hampshire. For more information about NCHC, Emergency Preparedness in the North Country and other North Country Public Health initiatives, visit: www.NCHCNH.org or call: (603)259-3700. North Country Health Consortium, home of the North Country Public Health Network, recently deployed Public Health Emergency Preparedness (PHEP) Coordinator, Jim Richardson, to attend the Federal Emergency Management Agency (FEMA) Training Center in Anniston, Alabama. Richardson, a career Public Safety and Emergency Management veteran, completed the 4-day training, titled "Framework for Healthcare Emergency Management,” a course designed for personnel who are responsible for the development, implementation, maintenance, and administration of emergency management programs and plans for healthcare facilities. This training marks Richardson’s 4th trip to the Anniston FEMA site for training. Richardson joined the North Country Health Consortium (NCHC) in the Summer of 2018 to accept the PHEP Coordinator role for the North Country region, where he collaborates with several regional partners, including healthcare and long-term care agencies. “I am happy to be able to leverage my past work experiences in the field of public safety and emergency management with my North Country partners,” said Richardson. The PHEP Coordinator works with regional partners to emphasize planning for points of dispensing (POD), a federally instituted best-practice model designed to provide medications, vaccines, or medical supplies to the community during a public health emergency. The Coordinator also assists partner organizations in conducting emergency drills and exercises to compliance with the new Centers for Medicare and Medicaid Emergency Preparedness rules. Effective November 2017, these rules require seventeen provider types, including hospitals, long-term care facilities, and community health centers, to have emergency operations plans, conduct drills and exercises, and have policies and procedures in place in the event their facility experiences an emergency. Before joining NCHC, Jim spent two years in Massachusetts where he was the PHEP Coordinator and Program Manager for forty-nine cities and towns with a population of 1.7 million residents. Native to New Hampshire, Richardson has eight years of PHEP experience in his home state as a Public Health Network Coordinator in southern NH. 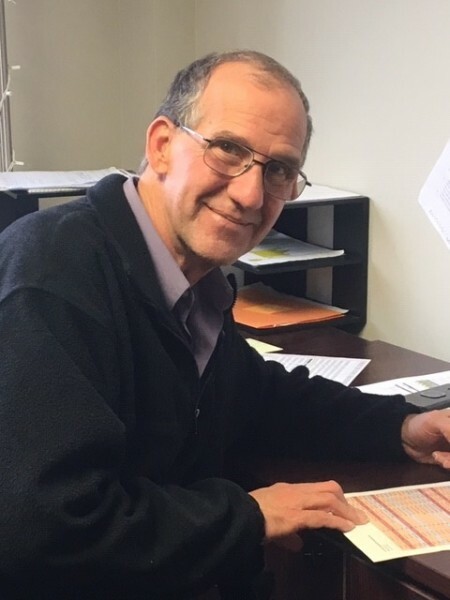 No stranger to northern NH, however, Jim has also partnered with many North Country schools and school administrative units (SAUs) during his time working on the NH Homeland Security and Emergency Management’s (HSEM) School Safety and Security Program. As a retired Battalion Chief for the Derry, NH Fire Department, Richardson’s early career included twenty-six years in public safety services. The North Country Health Consortium is a non-profit public health organization based in Littleton that collaborates with health and human services providers serving northern New Hampshire. For more information about NCHC and the North Country Public Health Emergency Preparedness program, visit: NCHCNH.org or contact Jim Richardson: jrichardson@NCHCNH.org or (603)259-3700 x255. Jim Richardson, Public Health Emergency Preparedness (PHEP) Coordinator for the North Country region, recently returned from a trip to the Federal Emergency Management Agency (FEMA) Training Center in Anniston, Alabama after completing a 4-day training designed for personnel who are responsible for the development, implementation, maintenance, and administration of emergency management programs and plans for healthcare facilities. Back at the North Country Health Consortium (NCHC) headquartered in Littleton, NH, Richardson will continue to work with regional partners- including health care and long-term care facilities- to ensure emergency management plans are sound and in compliance with the new Centers for Medicare and Medicaid Emergency Preparedness rules. 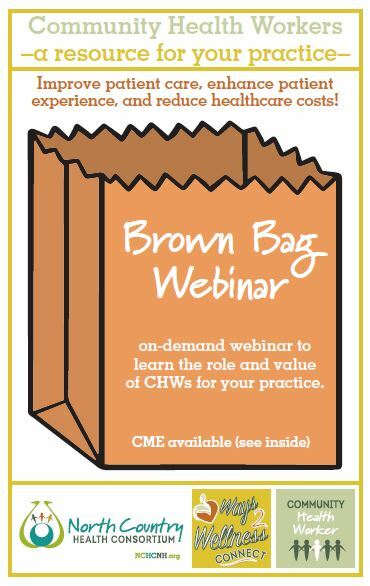 On-demand webinar: Learn how CHWs can enhance patient care, experience, and your practice! 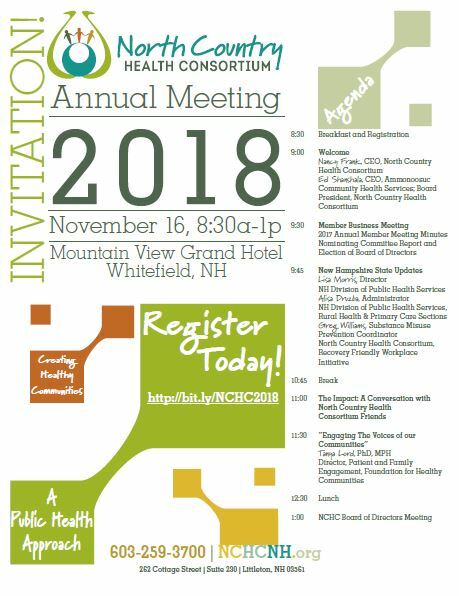 Join the North Country Health Consortium on Nov. 16th for NCHC's 2018 Annual Meeting! On November 16th, partners, friends, and community members are invited to join the North Country Health Consortium to celebrate another year of growth, achievement, and collaboration at NCHC’s 2018 Annual Meeting! Drug Take Back Day is Saturday, October 27th: Clean out your medicine cabinet! On Saturday, October 27th from 10 AM - 2 PM, North Country Police Departments participating in National Drug Take Back Day are calling on the community: Clean out your medicine cabinets! The following police stations will be ready to collect expired, unused, and unwanted prescription medications: Berlin, Bethlehem, Colebrook, Gorham, Groveton, Haverhill, Lancaster, Lisbon, and Littleton. Acceptable items for collection in designated drop boxes are prescription drugs and over-the-counter medications. Illegal drugs, needles, lotions or liquids, inhalers, aerosol cans, thermometers, and hydrogen peroxide will not be accepted. People depositing medications at drop box sites must keep medicines in their original container and also be the prescription holder. 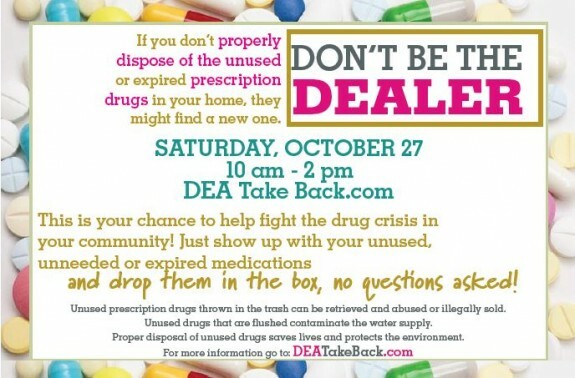 Twice a year the Drug Enforcement Administration (DEA) declares National Drug Take Back Day. Police departments across the country offer a convenient point-of-collection for the safe and anonymous disposal of unused, expired, and unwanted prescription medications to avoid accidental poisoning, overdose, and abuse, as well as contamination of the water supply, if flushed. During Drug Take Back Day this past April, the North Country brought in 815 pounds of potentially harmful medications. Together, North Country Police are challenging community members to help surpass last year’s total by making their way down to their closest participating station— on Saturday, October 27th from 10 AM – 2 PM— to deposit their expired, unused, and unwanted medicines! National Rx Drug Take Back Day is Saturday, October 27th from 10 AM – 2 PM. Clean out your medicine cabinet and make your way down to your closest participating local collection site at the following North Country police stations: Berlin, Bethlehem, Colebrook, Gorham, Groveton, Haverhill, Lancaster, Lisbon, and Littleton. 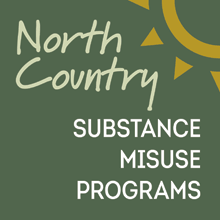 The North Country Health Consortium (NCHC) is expanding its portfolio of programs to address Substance Misuse issues in the North Country, including opioids, with two new grant awards, from the Health Resources and Services Administration, Federal Office of Rural Health Policy. “These resources will allow us to take an in-depth look at the full continuum of care— ranging from Prevention, Intervention, Treatment and Recovery— to provide direct service to individuals who are in need of services” says Nancy Frank, NCHC CEO. These services will include creating an innovative connection between emergency departments in the region and substance use disorder treatment resources. “North Country Healthcare looks forward to collaborating with the Consortium as well as other community partners and the State of NH to ensure that access to critical services and resources is available and coordinated to meet community need,” shares Edward Duffy, Interim CEO of North Country Healthcare- the five-medical center affiliation that includes local hospital emergency departments. In support of NCHC’s mission as a public health organization, a campaign focused on substance/opioid misuse will be designed for the needs of North Country residents and will include education and training for individuals, families, law enforcement, health care providers, and others. Recognizing the many initiatives that are in motion to address Opioid Use Disorders in the North Country, NCHC will also support an assessment of services and resources related to substance misuse treatment and recovery in the region to help ensure collaboration, non-duplicative services, and identify gaps. The North Country Health Consortium, a non-profit public health organization based in Littleton, serves Coos and northern Grafton Counties. NCHC collaborates with health and human services providers in northern New Hampshire. For more information about NCHC, visit: www.NCHCNH.org or call: (603)259-3700. The inaugural UP Granite Youth Conference on September 21st hosted students from all over Coos and Northern Grafton counties around the unifying theme, “UP,” designed to encourage young people in the North Country to get UP, stand UP, and speak UP against drug and alcohol misuse, while working towards a positive school climate that is respectful of all students. The North Country Health Consortium (NCHC) organized and sponsored the event at the Mountain View Grand in Whitefield, partnering with 10 local schools to ultimately gather a crowd of 140 youth to represent their schools: Berlin, Gorham, Littleton, Woodsville, Lincoln, Profile, Groveton, North Country Charter Academy, Lisbon, and White Mountains Regional High School. Headlining the UP Conference was a national speaker on recovery, Tony Hoffman, who described his career in the off-road racing and stunt riding cycle sport— BMX—when he was in high school and a top-ranked BMX amateur boasting multiple endorsements. However, experimentation with alcohol and other drugs derailed his early success, leading him to a two-year prison sentence. Today, Hoffman travels the country, bringing awareness to the dangers of prescription pill and heroin abuse and advocating for a shift in thinking towards current addiction-recovery processes. Throughout the afternoon’s activities, students enjoyed opportunities to interact and express themselves, sharing their ideas and aspirations to improve their school and community climate, especially as related to substance use. They advocated for more resources in their community and school, so that people with a substance misuse problem can get the help they need, when they need it. Students also spoke out for more education about substances, both in the school and community, and ways to help students realize their potential without resorting to drugs. Wrapping up the UP Granite Youth Conference, Rapper GeNreal, closed with two inspirational performances that reinforced previous messages. Funding for this event was provided in part by the NH Bureau of Drug and Alcohol Services. The North Country Health Consortium is a non-profit public health organization based in Littleton that collaborates with health and human services providers serving northern New Hampshire. To learn more about the UP Granite Youth Conference and how your school can get involved next year, contact NCHC’s Substance Misuse Prevention Coordinator, Greg Williams: gwilliams@NCHCNH.org. For more information about NCHC, visit: NCHCNH.org or call: (603)259-3700. Students representing 10 schools from all over Coos and northern Grafton Counties showed “UP” for substance misuse prevention in their schools and communities at the inaugural UP Granite Youth Conference hosted by the North Country Health Consortium in September. To learn more about the UP Youth Conference and how to get your school involved next year, contact NCHC Substance Misuse Prevention Coordinator, Greg Williams: gwilliams@NCHCNH.org. The North Country Health Consortium (NCHC) invites the community to a ribbon-cutting ceremony and open house for the newly constructed Friendship House, a residential substance use disorder treatment facility. The event is set for October 19th from 10 AM - 12:00 PM. Beginning with a ribbon cutting ceremony from 10 - 10:30 AM, refreshments and guided tours will be offered after the ribbon cutting until 12 PM. The state-of-the-art Friendship House treatment facility broke ground last Fall, replacing the former building that had served the area for over 30 years, and will enhance services, capacity, and access to needed substance use disorder resources in the northernmost region of New Hampshire. For more information about the event, contact NCHC Office Manager, Karen Hoyt: khoyt@NCHCNH.org. The Friendship House is located at 2957 Main Street in Bethlehem, NH. The North Country Health Consortium is a non-profit public health organization based in Littleton that collaborates with health and human services providers serving northern New Hampshire. For more information about NCHC, visit: www.NCHCNH.org or call: (603)259-3700. The North Country Health Consortium invites the community to a ribbon cutting and open house event on October 19th from 10 AM – 12 PM to celebrate the opening of the newly constructed Friendship House, a substance use disorder treatment facility at 2957 Main Street in Bethlehem, NH. The North Country Health Consortium (NCHC) now holds the contract for the Grafton County Drug Treatment Court (DTC), an Alternative Sentencing Program designed to help adult offenders whose substance use disorder has led to criminal behavior. The mission of the Drug Treatment Court Sentencing Program for Grafton County is to assist criminal offenders in breaking the cycle of crime and substance misuse, while improving community safety, and decreasing financial costs currently incurred by the criminal justice system. Within an 18- to 36-month window, each part of the multi-phase intervention program focuses on key concepts of addiction recovery, from stabilization to continuing care. DTC works with its participants to determine the appropriate level of care needed, collaborating between several agencies to provide substance use disorder treatment, psycho-educational programs, and consistent supervision—including swift sanctions for violations and rewards for positive behavior— aimed at supporting participants to maintain a drug-free lifestyle. The North Country Health Consortium is a non-profit public health organization based in Littleton that collaborates with health and human services providers serving northern New Hampshire. For more information about NCHC, visit: NCHCNH.org or call: (603)259-3700. 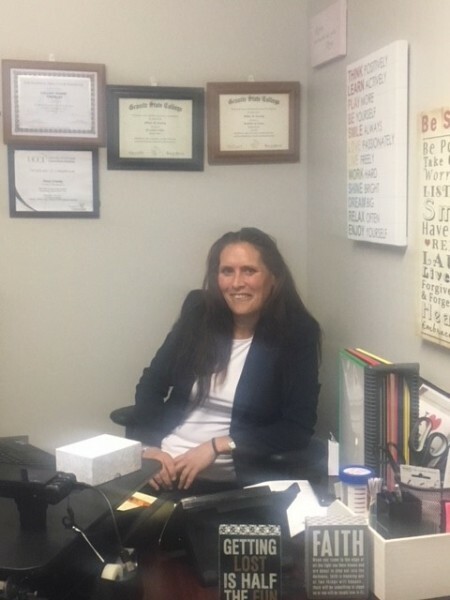 The North Country Health Consortium (NCHC) welcomes Lillian “Annie” Crowley to the team as the Coordinator for the Grafton County Drug Treatment Court, an Alternative Sentencing Program focused on rehabilitation and designed to help adult offenders whose substance use disorder has led to crime. 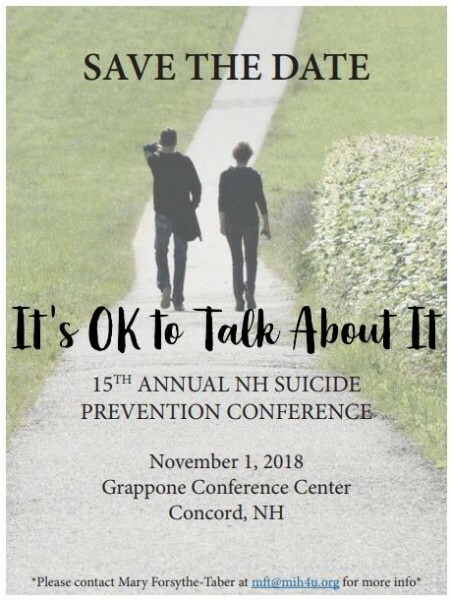 CHaD (Children's Hospital at Dartmouth Hitchcock)/Injury Prevention Center will be holding their 15th Annual NH Suicide Prevention Conference on November 1st at the Grappone Conference Center in Concord. Look out for the announcement when registration opens! Are you, or someone you know, living with or caring for a loved one with a chronic condition(s), such as diabetes, arthritis, high blood pressure, heart disease, COPD, chronic pain, and anxiety? Join the Better Choices, Better Health Chronic Disease Self-Management Workshop to gain the support and skills to coordinate all the things needed to manage your health, keep active, and feel more in charge of your life—or help a loved one to do so. Sign up for free at (603)575-9078. Better Choices, Better Health is a program created and tested at Stanford University, with proven results. Program participants have shown to improve in areas such as exercise, general health, fatigue, and spending fewer days in the hospital. During the once-weekly course over six weeks, participants will be guided to make weekly action plans, share experiences, and help each other solve problems they come across in creating and carrying out their self-management program. Topics covered during Better Choices, Better Health include: Techniques to deal with problems such as frustration, fatigue, pain and isolation; Appropriate exercise for maintaining and improving strength, flexibility and endurance; Appropriate use of medications; Communicating effectively with family, friends, and health professional; Nutrition; Decision making; How to evaluate new treatments… and more! 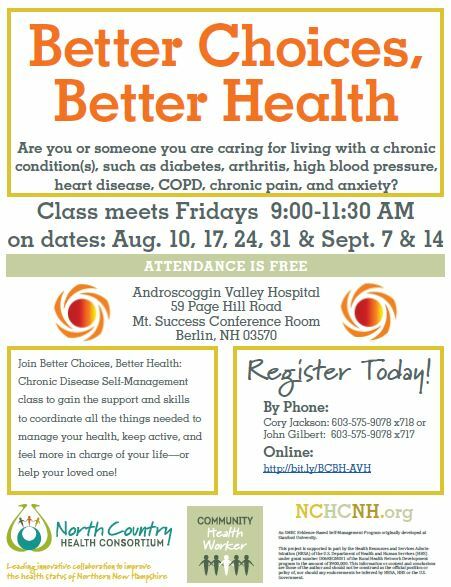 The upcoming Better Choices, Better Health Workshop will take place at Androscoggin Valley Hospital in Berlin on Fridays from 9:00 – 11:30 AM on each of the following dates: August 10, 17, 24, 31, and September 7 and 14. Space is limited. Register for free online: http://bit.ly/BCBH-AVH. Contact the program leaders, John at jgilbert@NCHCNH.org or (603)575-9078 x717, or Cory at cjackson@NCHCNH.org or (603)575-9078 x718. The North Country Health Consortium is a non-profit public health organization based in Littleton that collaborates with health and human services providers serving northern New Hampshire. 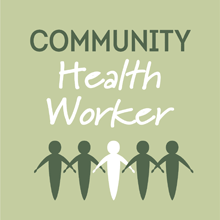 To learn more about Community Health Workers and other NCHC programs, visit: www.NCHCNH.org or call: (603)259-3700. Often, opioid prescriptions that are not finished by the patient are stored in the household for potential future pain management. Along with unmonitored medications for attention deficit disorder, severe arthritis, and other conditions, opioid prescription drugs are commonly easily accessible for abuse and diversion. The drug drop box is available to the community for prescription drug collection at the Lisbon Police Department every day from 7:00 AM-midnight. Accepted items for the drop box are prescription drugs and over-the-counter medications. Refrain from depositing the following items that are not accepted: illegal drugs, needles, lotions or liquids, inhalers, aerosol cans, thermometers, and hydrogen peroxide. Please note: Only prescription holders are authorized to deposit their own prescriptions for disposal. The permanent drop box was made possible by the KidCents Safe Medication Program and the Rite Aid Foundation. Substance Misuse Prevention Coordinator at the North Country Health Consortium (NCHC), Greg Williams, works with the Drug Enforcement Administration (DEA) to partner with local law enforcement in an effort to increase the number of permanent prescription drop boxes in the North Country region. Local police stations that currently carry a permanent drop box include: Berlin, Bethlehem, Haverhill, Lancaster, Littleton, and most recently, Lisbon. Any local police departments interested in applying for a permanent drop box is encouraged to contact the North Country Health Consortium for assistance. North Country Health Consortium is a non-profit public health organization based in Littleton that collaborates with health and human services providers in northern New Hampshire. For more information about acquiring a permanent prescription drug drop box in your local community or other Substance Misuse Prevention efforts, contact: gwilliams@NCHCNH.org or (603)259-3700, x295. To learn more about NCHC, visit: NCHCNH.org. 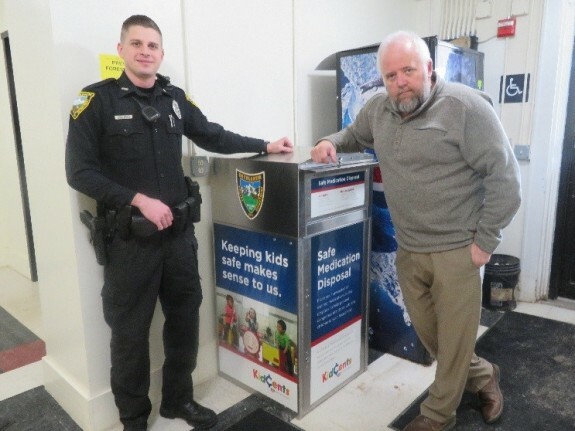 Lisbon Chief of Police, Scott Pinson, and Greg Williams, Substance Misuse Prevention Coordinator at the North Country Health Consortium (NCHC), debut the newly installed permanent prescription drop box at the Lisbon Police station. Clean out your medicine cabinets for Drug Take Back Day, Saturday 10 AM - 2 PM! On Saturday, April 28th from 10 AM - 2 PM, the North Country will be participating in National Prescription Drug Take Back Day, with the following local police stations on hand for collection of expired and unused medications: Berlin, Bethlehem, Colebrook, Gorham, Groveton, Haverhill, Lancaster, Littleton, and Lisbon. 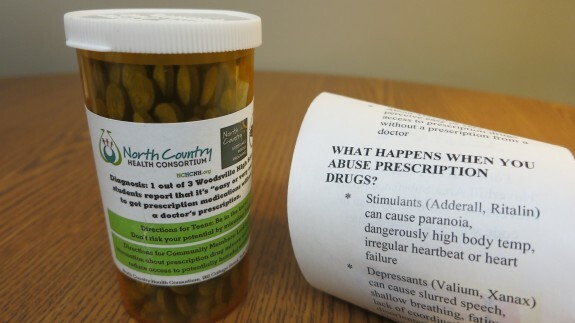 Together, North Country Police Departments call on community members to drop off any unused, unwanted, or expired prescription drugs—no questions asked. Accepted items for drop boxes at all locations are prescription drugs and over-the-counter medications. Illegal drugs, needles, lotions or liquids, inhalers, aerosol cans, thermometers, and hydrogen peroxide will not be accepted for collection, with the exception of the Groveton PD. With help from the Groveton EMS, the local station will be equipped to handle needles and sharps. Groveton PD asks that medications be left in their original containers and to avoid mixing medications and sharps, as they will be disposed of separately. Twice a year across the country, participating police departments encourage community members to clean out their medicine cabinets, offering a point-of-collection at their local station for the safe and anonymous disposal of unwanted prescription medications. Unused and expired prescription drugs are a matter of public safety with the potential to cause accidental poisoning, overdose, and abuse. While unused prescriptions thrown in the trash can be retrieved and abused or illegally sold, when flushed, these drugs contaminate the water supply. Proper disposal of unused drugs both saves lives and protects the environment. Drug Enforcement Agency (DEA) officials had reported that last year’s Take Back event in October, 2017 saw 48 tons of expired or unwanted prescription drugs collected between the six New England states alone—456 tons nationwide—representing the highest collection numbers to date. New Hampshire was third among New England states, with more than 13,000 pounds of prescription medication collected at more than 100 sites across the state. 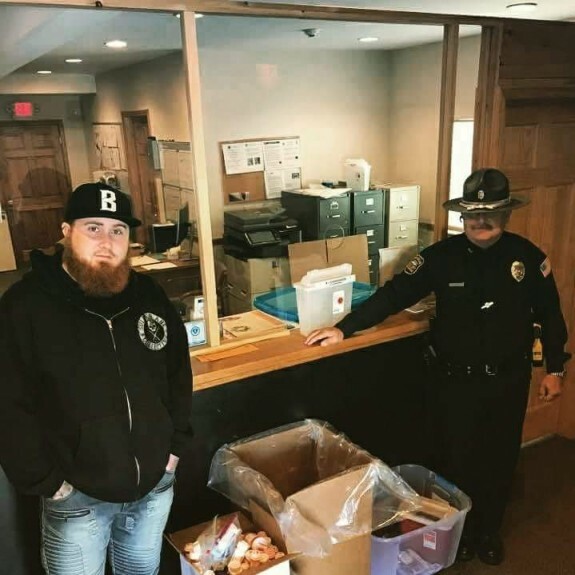 Standing by at the Groveton Police Department for National Prescription Drug Take Back Day in October, 2017, Program Coordinator at the North Country Health Consortium (NCHC) and Student Assistance Professional (SAP) of Groveton High School, Erik Becker, will be on hand again to assist collection efforts for this year’s Drug Take Back Day on Saturday, April 28th from 10 AM - 2 PM. The Bethlehem Police Department has recently installed a permanent prescription drop box at their local station to allow for the proper disposal of unused and expired medications in an environmentally-friendly way, while keeping them out of the hands of kids and teens. The drug drop box is available to the community for prescription drug collection at the Bethlehem Police Department 24/7 year round with 24-hour video surveillance of the area. Accepted items for the drop box are prescription drugs (Schedule II – V controlled and non-controlled substances) and over-the-counter medications. Please refrain from depositing the following items that are not accepted: illegal drugs, needles, lotions or liquids, inhalers, aerosol cans, thermometers, and hydrogen peroxide. Substance Misuse Prevention Coordinator at the North Country Health Consortium (NCHC), Greg Williams, works with the Drug Enforcement Administration (DEA) to partner with local law enforcement in an effort to increase the number of permanent prescription drop boxes in the North Country region. Part of Williams’ work also includes facilitating National Prescription Drug Take Back Day, which occurs twice a year in April and October, with local police departments— both stations that do and do not have a permanent drop box. The next National Drug Take Back Day is on April 28th from 10 AM – 2 PM. Local police stations that currently carry a permanent drop box include: Berlin, Haverhill, Lancaster, Littleton, and most recently, Bethlehem. Other local police departments in various stages of the application process are expected to acquire a permanent drop box later this year. 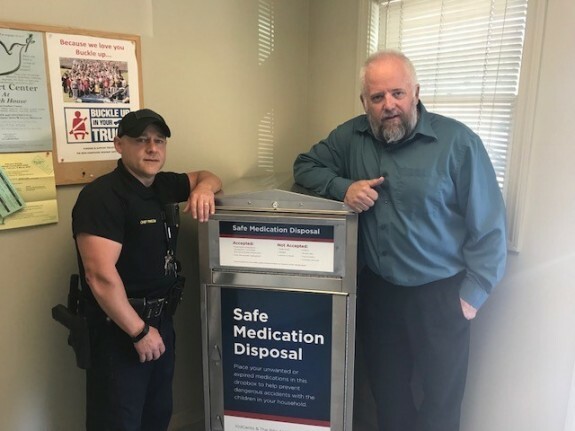 Officer Josh Basnar of the Bethlehem Police Department and Greg Williams, Substance Misuse Prevention Coordinator at the North Country Health Consortium (NCHC), debut the newly installed permanent prescription drop box at the Bethlehem Police station. Molar Express featured in Rural Health Information Hub! 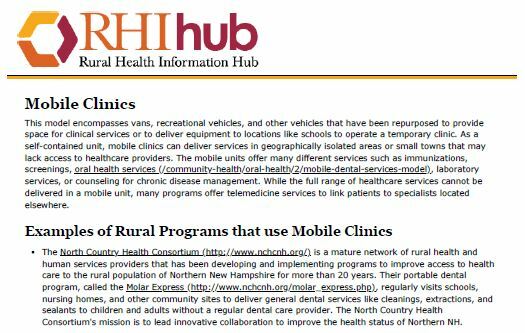 The Rural Health Information (RHI) Hub features Molar Express as an example of a rural program that utilizes a mobile clinic model to deliver general dental services to children and adults without a regular dental care provider. Click on the link or image to learn more! 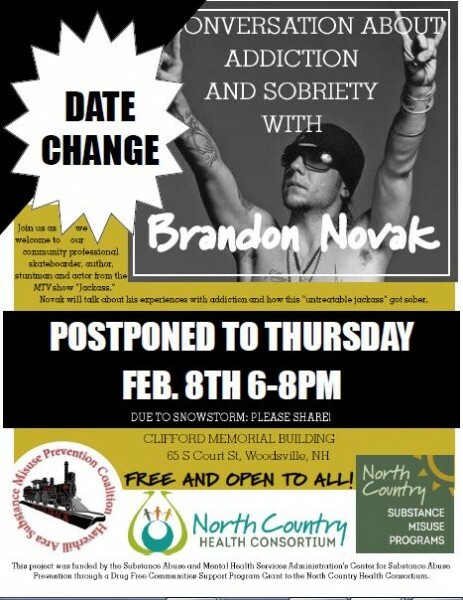 Brandon Novak talk about Addiction & Sobriety in Woodsville postponed to Thursday, February 8th! 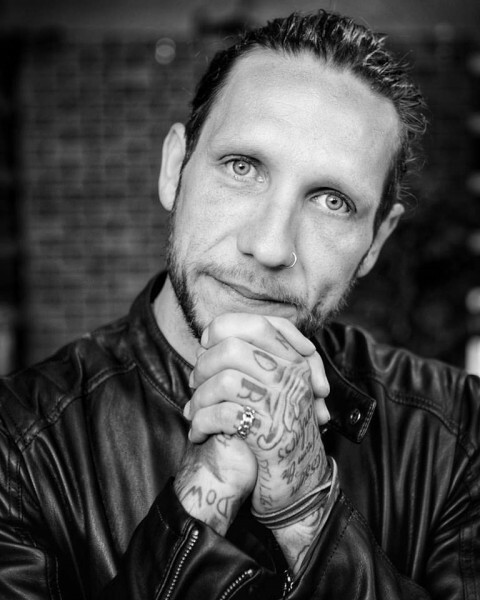 Due to the impending snow storm this Wednesday, "A Conversation About Addiction & Sobriety" with Brandon Novak has been postponed to Thursday, February 8th! We apologize for any inconvenience this may cause. The safety of our community is our top priority. The program will remain in the same venue, and at the same time. The Haverhill Area Substance Misuse Prevention Coalition (HASMPC) and the North Country Health Consortium (NCHC) invite the community to a free event featuring MTV television personality and best-selling author, Brandon Novak, who will talk about his personal experience with drug addiction and sobriety on February 7th at the Clifford Memorial Building in Woodsville starting at 6:00 pm. Novak was hooked on heroin and other drugs for over two decades, bouncing in and out of treatment programs. With three years of sobriety under his belt, Novak is now a prolific speaker and recovery advocate who relays the important message that it’s never too late to get help. "The disease of addiction is not a death sentence,” Novak has said, “as long as you are breathing, it is never too late and your history does not have to dictate your future.” In Novak’s New York Times best-selling book, “Dreamseller,” an addiction memoir, the author recounts his turbulent journey. 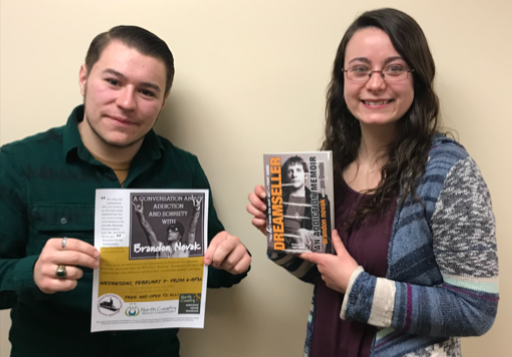 Brandon Novak will be speaking on Wednesday, February 7th from 6-8pm at the Clifford Memorial building at 65 S Court St. in Woodsville. This free event is open to all. For more information, contact Mariah at: mcoulstring@NCHCNH.org or (603)259-3700, ext: 251. This presentation is funded by the Substance Abuse and Mental Health Services Administration’s Center for Substance Abuse Prevention through a Drug Free Communities Support Program Grant to the North Country Health Consortium. Join MTV television personality and New York Times best-selling author, Brandon Novak at “A Conversation About Addiction and Sobriety” on Wednesday, February 7th in Woodsville at the Clifford Memorial Building, 65 S Court. St. For more information visit: www.NCHCNH.org or contact Mariah: mcoulstring@NCHCNH.org or (603)259-3700, ext: 251. HASMPC and NCHC invite the community to "A Conversation About Addiction & Sobriety with Brandon Novak"
Members of the Haverhill Area Substance Misuse Prevention Coalition (HASMPC), (pictured left to right) Joe Mitchell, the Coalition’s youth representative, and Mariah Coulstring, the North Country Health Consortium’s Drug Free Community Coordinator for the Haverhill/Woodsville area, invite the community to, “A Conversation About Addiction and Sobriety with Brandon Novak.” Television personality, Novak, will be speaking at the Clifford Memorial Building in Woodsville on February 7th from 6:00 – 8:00 pm. For more information, visit: http://nchcnh.org/ or contact Mariah at: mcoulstring@NCHCNH.org or (603)259-3700, ext: 251. NCHC's North Country Regional Community Compass now available! 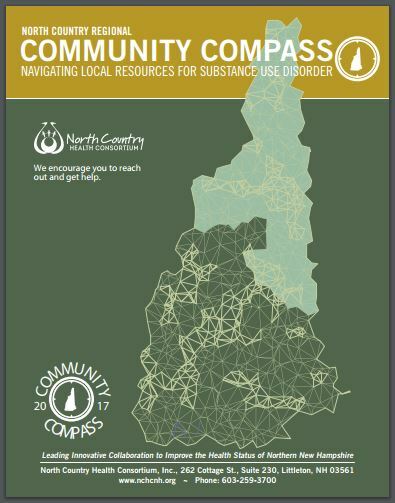 Follow the link to access NCHC's North Country Regional Community Compass of resources for substance misuse disorders throughout the region. Founded to organize healthcare providers, community resources, and increase access to health and human services, the North Country Health Consortium (NCHC) celebrated its 20th anniversary last week. The Consortium’s many leaders took the opportunity to reflect on the group’s growth, which has been largely driven by the challenges facing the health sector nationally and in the North Country. CEO Nancy Frank explained that NCHC exists because small regional partnerships weren’t working anymore. In 1995, Littleton and Berlin area coalitions organized. In 1997 a Rural Health Network Development Grant, with Ammonoosuc Community Health Services as the fiscal agent, brought together the two consortia to establish the North Country Health Consortium. “They decided they could never do what they needed to do without each other” explained Frank who said that the collaboration encouraged providers to look at “health” in a broad sense. She emphasized that the keystone goal was not merely good healthcare, but a social, economic, and physical environment where people can thrive. The Consortium pools strategic planning and management costs, coordinates resources, and shares community health information. Its headquarters has moved from two sites in Littleton, then to Whitefield, and most recently back to Littleton. A handful of NCHC’s efforts include: 350+ flu shots provided to students at school based-clinics, groundbreaking for the Friendship House facility, including new management of substance misuse disorders clinical services, and partnerships in Carroll County with the statewide Integrated Delivery Network initiative, resulting in more than 14 million dollars coming into the North Country to integrate primary care and behavioral health services. Just one example illustrates the creativity required to meet basic needs in the North Country. Preventive dental care is key for health, especially among children and seniors, but few live close enough to a dentist or can afford to make a semi-annual visit. The Consortium’s answer brings its portable dental clinic, Molar Express, to schools and nursing home, 31 sites in all, spread across the constellation of towns and villages north of the notch. NCHC also partners with White Mountains Community College to help support the training of allied health professionals, almost 100 this year. “This is a community that looks out for each other,” said Ed Shanshala, CEO of Ammonoosuc Community Health Services and Board President for the Consortium, who said that NCHC’s founders were “way ahead of the curve” in terms of pooling and coordinating resources across rural areas. 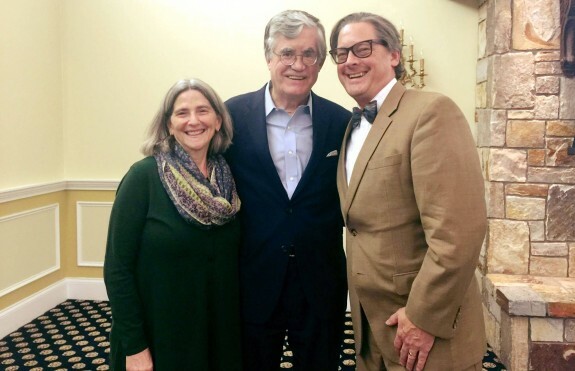 Left to right: Nancy Frank, CEO North Country Health Consortium (NCHC), former NH State Supreme Justice, John T. Broderick, and Ed Shanshala, CEO Ammonoosuc Community Health Services and NCHC Board President, pose for a photo after Mr. Broderick's moving account of his son's mental illness at NCHC's 20th Anniversary Annual Meeting. NCHC is a non-profit public health organization, learn more at NCHCNH.org. 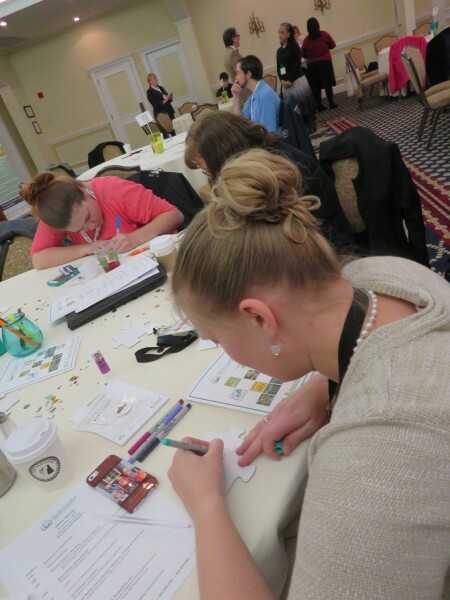 Annie Patoine, North Country Health Consortium (NCHC) employee, fills out a "piece of the puzzle" with more than 100 other participants at NCHC's Annual Meeting, representing all the people and programs that have made the Consortium successful for 20 years. Student Assistance Professionals (SAPs) from schools around northern New Hampshire and North Country Health Consortium (NCHC) staff attended a three-day substance misuse prevention training at the end of October to adopt the “Prime for Life” model into their respective programming for at-risk students and clientele. “Prime for Life” is an evidence-based practice that has demonstrated success in changing high-risk attitudes, drinking and drug use, and increasing abstinence with teens and adults. The program emphasizes inclusion and non-judgement. Attendees are trained to create a safe environment for people to consider how their choices affect their lives and make educated decisions about substance use based on what they learn about their personal risk factors. NCHC sent staff members, Kristy Letendre, Continuum of Care Coordinator for the North Country Regional Prevention Network, Chris St. Cyr, town of Berlin’s Restorative Justice Program Coordinator, and Annette Carbonneau, Program Manager/SAP Supervisor, to the three-day training in Augusta Maine along with SAPs from the following seven schools: Gorham Middle-High School, Groveton High School, Woodsville High School, Lisbon High School, White Mountains Regional High School, North Country Charter Academy, and White Mountains Community College. Attendance to this training was funded by the New Hampshire Department of Health and Human Services’ Bureau of Drug and Alcohol Services through a grant to the North Country Health Consortium. The North Country Health Consortium is a non-profit public health organization based in Littleton that collaborates with health and human services providers serving northern New Hampshire. For more information about NCHC and the North Country Regional Prevention Network, visit: www.nchcnh.org or call (603)259-3700. Student Assistance Proffesionals (left to right): Kattie McKinnon from White Mountains Regional High School , Jane King from Lisbon High School, Charlie Mae Johnson from Woodsville High School, Erik Becker from Groveton High School, Joy Burrill from Gorham High School, and Georgia Caron from North Country Charter Academy were part of the group that the North Country Health Consortium sent to “Prime for Life,” a three-day evidence-based Substance Misuse Prevention training in Augusta, Maine last month. 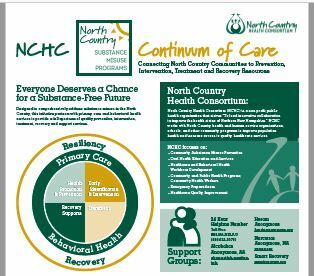 NCHC's North Country Continuum of Care resource guide released! Follow the link to access NCHC's Continuum of Care resource guide of Prevention, Intervention, Treatment, and Recovery resources in the North Country. Dedicated to reducing the harmful effects of drugs and alcohol in the Woodsville/Haverhill area communities, this fall, the Haverhill Area Substance Misuse Prevention Coalition (HASMPC) is rallying behind efforts to reduce underage drinking, including, the “Buyers Beware” sticker shock campaign, “Banner Swap” project, and calling attention to NH state laws. On Saturday September 30th, student volunteers from Woodsville High School worked with HASMPC to affix “Buyers Beware” stickers to alcohol packaging sold at area businesses as part of the local campaign. The main purpose of the “Buyers Beware” project is to raise awareness about the consequences associated with supplying alcohol to minors, including paying a fine of up to $2000 and/or serving up to a year in jail. This sticker shock campaign will be an ongoing effort, with “Buyer Beware” tags getting periodically replaced as alcohol inventory is sold. When it comes to reducing underage drinking, HASMPC recognizes the importance of “all hands on deck,” and advises the community to know and understand New Hampshire’s Party Host Liability Law. Many people are unaware that if they host a party or social gathering at their home, they are legally responsible for the safety of their guests. If minors are present drinking alcohol or using drugs, the party “host” may be charged with a misdemeanor, fined up to $2,000 and/or spend a year in jail. Party guests under the age of 21 with an alcoholic drink stand to lose their license, vehicle, and college scholarship. Community members whose properties may be the site of underage drinking or drug parties are advised to: take action to prevent the party; try to stop the party if it has already started; and tell local law enforcement officials as soon as possible. Everyone in the community has a role to play to prevent underage drinking. Later this month, members of HASMPC will be approaching local businesses that display banners advertising alcohol to request that they swap the advertisements for ad-neutral banners supplied by the coalition. HASMPC thanks local business owners who are already involved with the “Buyer Beware” initiative and urge them to participate in the upcoming “Banner Swap” effort. Families are reminded to familiarize themselves with New Hampshire’s Party Host Liability Law and to help keep youth safe by avoiding the provision of alcohol and substances to minors. These projects are funded by the Substance Abuse and Mental Health Services Administration's Center for Substance Abuse Prevention through a Drug-Free Communities Support Program Grant to the North Country Health Consortium. Autumn leaves strewn about the streets are a familiar sight this time of year all around the North Country. But this fall, Woodsville and Haverhill area residents may also start noticing something else popping up around town: prescription drug bottles. That’s because the Prescription Drug Awareness Project is underway. Mariah Coulstring, newly appointed Drug-Free Communities (DFC) Coordinator, is facilitating the campaign with the Haverhill Area Substance Misuse Prevention Coalition (HASMPC). This project is funded by the Substance Abuse and Mental Health Services Administration's Center for Substance Abuse Prevention through a Drug-Free Communities Support Program Grant to the North Country Health Consortium. Newly appointed Drug-Free Community (DFC) Coordinator by the North Country Health Consortium (NCHC), Mariah Coulstring takes her post to facilitate the Prescription Drug Awareness Project in the Woodsville/Haverhill area. With the Prescription Drug Awareness Project underway, Woodsville/Haverhill area residents may notice prescription drug bottles— affixed with cautionary labels and containing information about the dangers associated with prescription drug misuse— scattered around local businesses and other public spaces throughout the community. The North Country Health Consortium (NCHC) is pleased to introduce Kristy Letendre as Continuum of Care Facilitator of the North Country Public Health Network headed by NCHC. Letendre joins NCHC as a seasoned Substance Use Disorder professional, with a 14-year career at Tri-County Community Action Program (TCCAP). Since starting at TCCAP in 2004, Letendre worked in the Division of Alcohol & Drug Services, becoming the Division’s Director in 2014. As the Director of the Division of Alcohol & Drug Services until 2016, Letendre headed high and low residential programs, and the Outpatient department for the Friendship House in Bethlehem, including its satellite locations throughout the North Country. From 2016 to 2017 at TCCAP, Letendre was the Director of Clinical Services, maintaining senior leadership of Alcohol and Other Drugs programs, before assuming the Continuum of Care (CoC) role at the North Country Health Consortium. 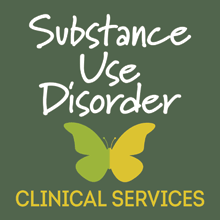 As the CoC Facilitator, Letendre is tasked with bridging the vital components of care and services for Substance Use Disorders (SUD) with Regional Public Health Network (RPHN) partners throughout Coӧs and northern Grafton Counties. In the CoC role, and with her vast field experience, Letendre is primed to facilitate opportunities for collaboration amongst regional SUD experts and service providers across the continuum, including: health promotion, prevention, early identification and intervention, treatment, and recovery supports. The North Country Health Consortium is a non-profit public health organization based in Littleton that collaborates with health and human services providers serving northern New Hampshire. For more information about NCHC and the North Country’s Continuum of Care Development plan, visit: www.NCHCNH.org or contact Kristy Letendre at: kletendre@NCHCNH.org and (603) 259-3700 x258. 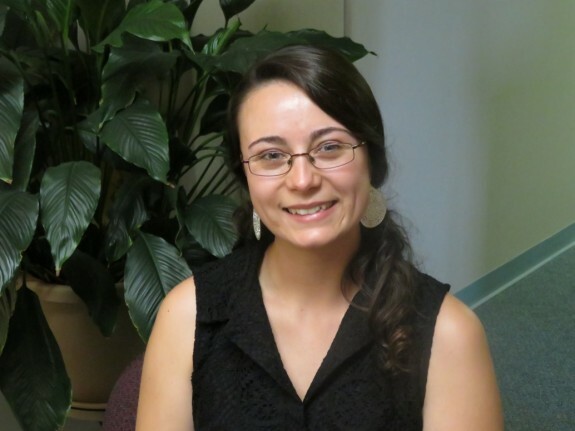 The North Country Health Consortium welcomes Kristy Letendre to the NCHC team in her new role as Continuum of Care Facilitator of the North Country Public Health Network. On July 24 – 28th, North Country middle schoolers enjoyed an action-packed week, exploring a variety of health and medical professions at the STEM-Health Careers Summer Camp in Littleton. For the 8th consecutive summer, the Northern New Hampshire Area Health Education Center, a program of the North Country Health Consortium (NCHC), partnered with Hugh J. Gallen Career and Technical Center in Littleton to offer the camp. During the week, middle school students from the North Country take part in a fun, local hands-on opportunity to experience a vast array of health careers. Long-time hosts of the STEM Camp program, White Mountains Community College in Berlin will resume a Berlin-based camp in summer 2018. This year, the Littleton camp at Hugh J. Gallen welcomed 16 students, including several returning campers. Campers used the state-of-the-art medical training facility at the Hugh J. Gallen Center, including “SimMan”— a life-like simulator that talks back and tasks students with controlling how it reacts, while another group administered CPR and other life-saving measures. Other activities of the Littleton camp included: intubating simulation models, ranging from infant to adult-sized; inserting IVs into a training arm; frog dissection for learning the anatomy; midwifery and childbirth demonstration; creating clay replicas of the human anatomy; oral health training activities with the Molar Express; triaging during simulated mass casualty situations; and blood typing. Graciously welcoming campers for the last five summers, staff at Littleton Regional Healthcare (LRH) wrapped up the camp week, giving the group of young medical career prospects a full tour of LRH’s facilities. NCHC would like to thank all supporters, presenters, and contributors of the STEM-Health Careers Summer Camp program. Without the collaboration of North Country healthcare organizations, this opportunity and rich experience for students to explore the health field would not be possible. NCHC would again like to thank Natanya Champney of “As it Was Midwifery” and Littleton Regional Healthcare for their generosity. The North Country Health Consortium (NCHC) is a non-profit public health organization based in Littleton that collaborates with health and human service providers serving northern New Hampshire. To learn more about STEM-Health Careers Summer Camp, visit www.nchcnh.org or call Diana Gibbs, NCHC Program Manager, at (603) 259-3700 ext. 222. The North Country Health Consortium (NCHC) is pleased to announce it has received a Rural Health Network Development (RHND) grant from the Health Resources and Services Administration (HRSA) Office of Rural Health Policy totaling $900,000 to support expansion of existing programming to strengthen the health care delivery system in Northern New Hampshire. The three-year RHND grant will support the development of the Ways2Wellness CONNECT program, emphasizing the integration of Community Health Workers (CHWs) with care coordination teams in the area. Further, NCHC will hire and train CHWs to partner with area health care teams to assist older adult patients in accessing care and services in the community. 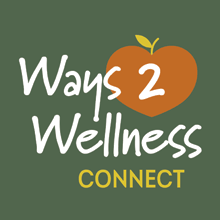 The Ways2Wellness CONNECT model was designed to keep patients with chronic diseases from “falling through the cracks,” with CHWs functioning as both care coordinators and health educators to bridge connections between providers, patients, family members, communities, and resources. In conjunction with the Ways2Wellness CONNECT program, health professions students completing rural community rotations through NCHC’s Live, Learn, Play in Northern NH program will participate in care coordination activities with CHWs. The North Country Health Consortium is a non-profit public health organization based in Littleton that collaborates with health and human services providers serving northern New Hampshire. For more information about NCHC and Community Health Workers, visit: www.nchcnh.org or call (603) 259-3700. The North Country Health Consortium (NCHC) is pleased to announce registration for Recovery Coach Academy training is open. This free training will provide participants with skills to guide, mentor, and support anyone who would like to begin or sustain long-term recovery from addiction to alcohol or other drugs. Recovery coaches are individuals who help people navigate non-clinical aspects of recovery and who may or may not be in long-term recovery themselves. The 5-day intensive recovery coach training course will begin in August and meet on Saturdays from 8:00 a.m – 4:00 p.m. on the following dates: August 5, 12, 19, 26, and September 9th at the North Haverhill United Methodist Church (UMC). Participants are capped at 15 and must commit to attending all 5 dates to complete the training. 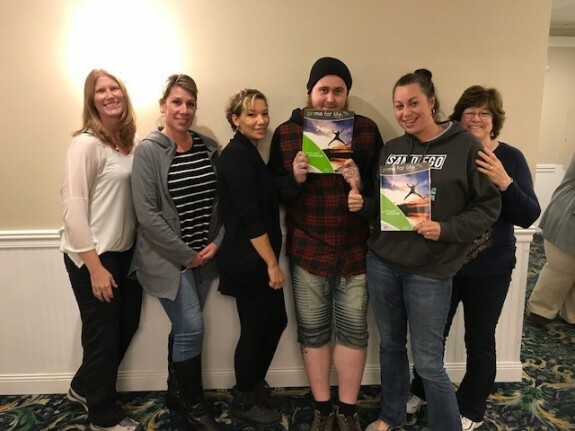 Course instructors are from Hope for NH Recovery and are trained recovery coaches credentialed by the Connecticut Community for Addiction Recovery (CCAR). Scholarships for participants and course materials are made possible thanks to grant funding from the National Association of County and Health Officials (NACCHO). The upcoming summer course is the last of a series of trainings available with support from NACCHO. Space is generously provided by Pastor Clint Brake and the North Haverhill UMC. For more information about the recovery coach training, contact Amy Jeroy at ajeroy@nchcnh.org, or call (603) 259-3700 x228. To register for the upcoming summer 2017 Recovery Coach Academy training, go to: http://bit.ly/RecoveryCoach or call Karen at 603-259-3700 ext. 244. Home of the Northern NH Unit Medical Reserve Corps, the North Country Health Consortium (NCHC) is a non-profit public health organization based in Littleton. NCHC collaborates with health and human services providers to improve the health status of northern New Hampshire. To learn more about NCHC, visit: www.nchcnh.org or call (603)259-3700. Come to a community event on Thursday, July 27th from 6:00 pm – 8:00 pm. This free event will include training of participants in the administration of the opioid overdose-reversal drug, Naloxone, and an opportunity for the group to engage in a question and answer session with a panel of field experts: NH Licensed Emergency Medical Technician (EMT) and Errol Rescue Training Officer, Jim MacDonald; and from the North Country Health Consortium (NCHC), Continuum of Care Facilitator, Kristy Letendre, and Public Health Coordinator, Elaine Belanger. All are welcome and qualified attendees will receive a free Naloxone kit—also called ‘Narcan’— with the completion of training. The training presentation will cover signs and symptoms of an opioid overdose, the importance of calling 9-1-1 and rescue breathing, and step-by-step instructions on how to administer naloxone. This event is organized by Coӧs County ServiceLink, a Tri-county Community Action Program (TCCAP), presented by NCHC, and hosted by Brookside Park Apartments. Join us on July 27th from 6:00 p.m. – 8:00 p.m. in the conference room of the Brookside Park Apartments located at 155 Maynesboro Street in Berlin. RSVP is appreciated but not required. North Country Health Consortium is a non-profit public health organization based in Littleton that collaborates with health and human services providers in northern New Hampshire. To RSVP or for more information about scheduling Naloxone administration training for your group or at your next event, contact: ebelanger@nchcnh.org or (603) 259-370, x229. To learn more about NCHC, visit: www.nchcnh.org. Middle School Students: Register Now for Littleton STEM-Health Careers Summer Camp! ATTENTION Parents! Are you the parent of a middle school student? Are you looking for a different kind of summer camp this year? The North Country Health Consortium and the Hugh J. Gallen Career and Technical Center are pleased to invite middle school students to explore Science, Technology, Engineering and Mathematics with a Health Careers twist (STEM-Health Careers Summer Camp)! The Littleton STEM-Health Careers Summer Camp is open to students who have completed 7th or 8th grade. Space is limited so early registration is essential. This week-long STEM-Health Career Camp will be held each day from 9am-3pm at the Hugh J. Gallen Career and Technical Center in Littleton the week of July 24-28. Attendees of the STEM-Health Careers Summer Camp will be given hands-on career exploration opportunities, including the use of state-of-the-art dental and medical simulators, various workshops and presentations with health professionals, and a comprehensive hospital tour experience. The focus of the STEM-Health Career Summer Camp initiative is to provide students with a low-cost, local opportunity to explore a vast array of health careers. Participating in this hands-on, interactive camp is a fun experience that will allow students to explore different health professions with the hope that they may further pursue a career in the field. Developing interest at the middle school level allows students to gain a broad understanding of the potential opportunities that exist in the field. On June 1st, the North Country Health Improvement Working Group, an initiative of the North Country Health Consortium (NCHC), hosted an educational half-day event devoted to heart health at the Mountain View Grand in Whitefield. Entitled “Live Heart Smart,” the event gathered community members from around the North Country and surrounding regions to raise awareness around heart disease and stroke, with a focus on highlighting local resources and personal wellness practices to promote heart healthy living. The “Live Heart smart” agenda boasted relevant topics presented by experts local to the North Country and beyond, including the keynote address, “the Heart is the Seat of the Body.” An open heart surgery survivor, Kathleen Kelley, who is an independent consultant to non-profit organizations as well as a Randolph resident, kicked off the keynote by telling her personal story to regaining health and encouraging the audience to be a “heart hero” to themselves and their loved ones. Sharing the stage with Kelley, Professor of Health and Human Performance, and Director of the Center for Active Living and Healthy Communities at Plymouth State University, Dr. Barbara McCahan, provided heart research along with tips to reframe and reduce stress. Breakout session topics that followed covered: practical fitness tips for heart health, “Living an Anti-inflammatory Life,” mindfulness meditation, and overcoming ambivalence to health behavior change. Attendees left “Live Heart Smart” armed with resources, including the cookbook “Good and Cheap: Eating Well on $4/Day” by best-selling author, Leanne Brown, and a fold-out guide produced by NCHC that highlights heart-friendly offerings and events around the North Country, including farmers’ markets, cooking demos, support groups, and physical activity options. The North Country Health Consortium is a non-profit public health organization based in Littleton that collaborates with health and human services providers serving northern New Hampshire. For more information about NCHC, visit: www.nchcnh.org or call (603)259-3700. Live Heart Smart! Check out heart healthy resources from around the North Country! On Thursday, June 1st, the Health Improvement Working Group of the North Country Health Consortium (NCHC) invites the community and health professionals to Live Heart Smart, a half-day event dedicated to heart health. Held from 10:00 AM – 2:00 PM at the Mountain View Grand in Whitefield, this educational event will leave attendees with plenty of practical knowledge and strategies to begin or recharge a Heart Smart way of life. Fun interactive breakout sessions will answer the What? Why? and How? behind simple and accessible tools and resources. Join us for: mindfulness meditation, practical “do anywhere” strength and cardio fitness methods, community health workers as patient advocates, Living an “anti-inflammatory” life, and overcoming ambivalence to adopt healthy habits. Continuing nursing education credits are available. Doors will open at 9:30 AM for registration with the event kicking off at 10:00 AM. Registration for Live Heart Smart is $25 and will include lunch and cookbook, “Good and Cheap: Eat well on $4/Day” to take home. To register for this event, go to: http://bit.ly/LiveHeartSmart. The North Country Health Consortium is a non-profit public health organization based in Littleton that collaborates with health and human services providers serving northern New Hampshire. For more information about NCHC visit: www.nchcnh.org . For questions about Live Heart Smart, contact Anna: ashum@nchcnh.org or (603)259-3700 x257. PLYMOUTH – On Wednesday, April 19th, the 3rd Community Health Worker (CHW) Summit in New Hampshire convened at the Common Man in Plymouth. 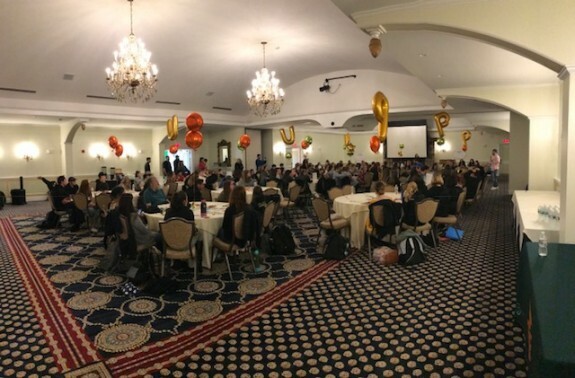 Hosted by the North Country Health Consortium (NCHC) in partnership with the Southern New Hampshire Area Health Education Center (SNAHEC), the full-day event gathered CHWs across the state together with other advocates representing healthcare and health and human services organizations. The day’s agenda was filled with a variety of field experts who delivered presentations and interactive breakout sessions centered on: understanding the current landscape for CHWs, fostering CHW leadership and collaboration, and looking at the road ahead to advance the CHW movement in New Hampshire. An informative panel session provided a platform for NH-based CHW’s— hailing from Indian Stream Health Center, Dartmouth Hitchcock Medical Center, the Nashua Health Department, and Manchester Community Health Center— to share successes, challenges, and insight gained in their roles on the job. On Monday, April 17, the North Country Health Consortium (NCHC) invites all legislators of Coos and Northern Grafton Counties to a breakfast discussion on the Student Assistance Program (SAP) in the North Country. SAP Counselors will be in attendance to share successes and challenges working the front lines to implement school-based substance misuse prevention curriculum in North Country schools, coordinating a full range of substance abuse prevention and early intervention services in their given schools and school districts. 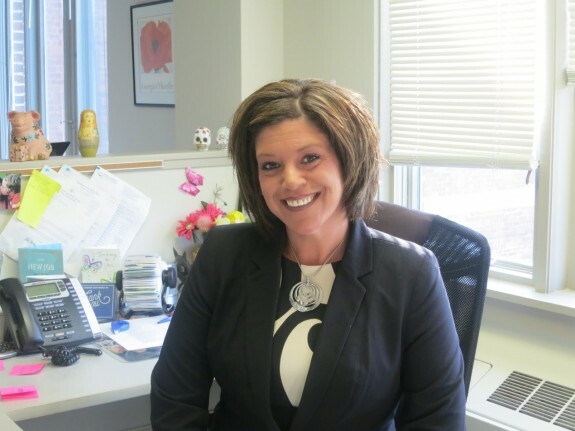 "One of the most important aspects of the SAP Counselor's role is relationship building with students and faculty," said Nancy Frank, Chief Executive Officer at the North Country Health Consortium. "To really integrate into their school as a trusted resource and someone students can talk to," said Frank, "SAP Counselors have to be there over time to ensure that relationships and programs are allowed to mature and programming is executed with full fidelity. This requires consistency in funding. I look forward to hearing from our SAP counselors and hosting this conversation with our local legislators." As the hub of the North Country Regional Public Health Network and Regional Substance Misuse Prevention Network, NCHC understands that Student Assistance Programs in middle and high schools are one of the most comprehensive, evidence-based school approaches to preventing and reducing alcohol, tobacco, and other drug use. NCHC works with schools to initiate grant funding and contracts with the state in order to place highly trained SAP Counselors in middle and high schools. Through state funding opportunities, NCHC provides individual and peer supervision for all SAP counselors throughout the North Country. The breakfast on Monday, April 17 will be held from 8:30 AM - 10:00 AM at the North Country Health Consortium located at 262 Cottage St. in Littleton. North Country legislators have been invited to join the discussion and listen to SAP Counselors talk about their experiences, successes and challenges, in the trenches of substance misuse prevention. The North Country Health Consortium is a non-profit public health organization based in Littleton that collaborates with health and human services providers serving northern New Hampshire. For more information about NCHC and the North Country Regional Public Health Network, visit: www.nchcnh.org or call (603)259-3700. The March 29th event will be held from 4:30 PM to 9:00 PM, and include: a pot luck supper; training for Naloxone administration by the North Country Health Consortium (NCHC); and screening of The Anonymous People, a documentary featuring stories from people amongst the 23.5 million Americans living in long-term recovery from drug and alcohol addiction. The event will open with a pot luck supper at 4:30 PM. Light refreshments will be provided, though attendees are encouraged to bring a dish to share. Training for Naloxone administration will run from 6:00 to 7:00 PM with Elaine Belanger, Public Health Coordinator at NCHC. All training participants will receive a free Naloxone kit - also known as Narcan – upon completion. Screening of The Anonymous People will start at 7:15 PM, followed by an open audience-driven discussion. The Hope for NH Recovery Community Center is located at 823 Main Street in Berlin. Open Monday – Friday 9 AM – 5 PM, with additional hours for mutual aid and other support groups. For more information, or if you plan to attend the event, please call Doris Enman at (603)752-9900 to reserve your Narcan kit for the training. The North Country Health Consortium (NCHC) is a non-profit public health organization that serves the North Country of NH. If you are unable to attend, but would like to learn more about scheduling a Naloxone training for yourself or your group, contact Elaine Belanger at the North Country Health Consortium: ebelanger@nchcnh.org or (603)259-3700 x229. On Tuesday, May 2nd at the Rialto Theater in Lancaster, NH, the North Country Health Consortium, in partnership with Norris Cotton Cancer Center, American Cancer Society, Southern NH Area Health Education Center, and the New Hampshire Comprehensive Cancer Collaboration, invites parents, community members, and local healthcare providers to attend a free educational event, including a film screening of Someone You Love: The HPV Epidemic. This documentary looks at the lives of five women affected by the Human Papillomavirus (HPV), the widely misunderstood virus that causes several types of cancer, including cervical cancer. Community members will learn about how they can protect themselves, their families, and their children- both sons and daughters. Providers are encouraged to attend to be part of the discussion to understand how they can help protect patients from future cancers. Continuing education will be available for nurses and providers. The HPV event on May 2nd will begin with doors opening to the public at 5:30 PM and the film beginning at 6:00 PM. A panel discussion with local experts— featuring a pediatrician, OB/GYN, and a representative from the NH immunization program—will begin at 7:30 PM, and include an opportunity for audience members to engage in Q&A with the panelists. Light refreshments will be provided for this event. There is no cost to attend, but your registration is appreciated. To register for the event, go to: http://bit.ly/NorthCountryHPVEvent. Contact Diana Gibbs for more information and questions: dgibbs@nchcnh.org or (603)259-3700 x222. Recovery Coach Academy Training begins March 25th - Sign up today! With generous grant funding from National Association of City and County Health Officials (NACCHO), the North Country Health Consortium and Northern NH Unit Medical Reserve Corps (MRC), partnered with Hope for New Hampshire Recovery, will be providing recovery coach training to increase addiction support services in the North Country. Open to all local members of the MRC and greater community, this 5-day intensive Recovery Coach Academy training utilizes the Connecticut Community for Addiction Recovery (CCAR) curriculum and will focus on providing students with the skills to guide, mentor and support anyone who would like to enter into or sustain long-term recovery from an addiction to alcohol or other drugs. Meeting times: 8:00 a.m. - 4:00 p.m.
LITTLETON— Last month on Wednesday, February 21st, the Health Improvement Working Group of the North Country Health Consortium (NCHC) convened Speak Up NH: Changing the way we talk about addiction in the North Country. This panel event gathered North Country community members— ranging from addiction and health and human services workers, high school students, and individuals in long-term recovery— in the Tower Room of the Littleton Opera House to address the issue of social stigmas faced by individuals with an addiction to alcohol and other drugs. The two-hour event featured a lineup of local experts, including: Ammonoosuc Community Health Services’ Director of Integrated Behavioral Health, Stephen Noyes, LICSW; Hope for New Hampshire Recovery’s Director of Recovery Development, Bernadette Gleeson, along with Center Manager of Hope’s Berlin location, Doris Enman, M.Ed. ; and Black Crow Project Co-founder and Groveton Student Assistant Counselor, Erik Becker. Through the course of the evening’s presentations and concluding questions and answers section, each speaker shed light on relevant topics spanning: what makes addiction a disease; the concept of raising the “recovery capital” of addicted individuals; the weight of our words and of our reactions to people when it comes to perpetuating stigma; and what it means to recover as a community. The Changing the way we talk about addiction in the North Country panel event piggybacks on the statewide campaign, Speak Up NH, an initiative of Partners for a Drug-free New Hampshire. The Speak Up NH campaign, which launched on February 8th at the Executive Council Chambers in Concord with the support of Governor Sununu, is a rallying cry to the people of NH to change the conversation around addiction in order to create a more supportive and inclusive environment that presents individuals with fewer roadblocks to recovery. The Region 7 IDN Meeting scheduled for Feb. 16, 2017 has been cancelled due to weather. For more information, please contact April Allin, IDN Program Manager, at aallin@nchcnh.org. The North Country Health Consortium is pleased to announce it has received a $13,000 grant on behalf of the Northern NH unit Medical Reserve Corp (MRC) from the National Association of County and Health Officials (NACCHO). These funds will support the training of 30 local volunteers—including current members of the MRC and community at large— to become certified Recovery Coaches, who will join the ranks of support service providers in the North Country to engage individuals struggling with addiction or who are in long term recovery for a substance misuse disorder. The North Country Health Consortium will partner with Hope for NH Recovery to provide two Recovery Coach Academy trainings to be scheduled for the spring and summer of 2017 in Littleton and Berlin. Recovery coaches are individuals who help people navigate non-clinical aspects of recovery and who may or may not be in long-term recovery themselves. Fifteen students will be enrolled to each 5-day intensive training lead by local Connecticut Community for Addiction Recovery (CCAR) trained coaches. Recovery Coach Academy trainers will be Holly Cekala, the Director of Recovery Support Services for Hope for New Hampshire Recovery, an affiliate of the Face it Together state organization, and Doris Enman, Manager of Hope for New Hampshire Recovery Berlin Community Center. Graduates of the recovery coach program will be distributed throughout the North Country and support each of the following hospital service areas: Weeks Medical Center, Upper Connecticut Valley Hospital, Littleton Regional Healthcare, Cottage Hospital, and Androscoggin Valley Hospital. Grant funds will cover the cost of the two trainings and materials for 30 students. The CCAR Recovery Coach Academy training will provide students with the skills to guide, mentor, and support anyone who would like to begin or sustain long-term recovery from addiction to alcohol or other drugs. For more information about the Recovery Coach Academy trainings and the opportunity to enroll, contact Amy Jeroy at ajeroy@nchcnh.org, or call (603) 259-3700 x228. On Wednesday, February 15, the North Country Health Improvement Working Group of the North Country Health Consortium (NCHC) invites you to Speak Up NH: Changing the way we talk about addiction in the North Country. This panel session is part of Partnership for a Drug-free NH’s statewide campaign, Speak Up NH, an initiative aimed at creating a more supportive and inclusive environment that presents individuals with fewer roadblocks to recovery. Arriving at the heels of the official campaign launch at the Executive Council Chambers in Concord on February 8th, the Speak Up NH panel event will follow suit to address the issue of stigma and initiate the conversation shift around addiction and substance misuse in the North Country. The Speak Up NH event will be joined by a panel of local experts to engage the audience with presentations on: the medical basis for understanding addiction, personal stories of hope and recovery, as well as insight and resources for the community to break the stigma and get involved with local efforts to help the North Country amidst the national crisis of substance misuse and addiction. Located at the Littleton Opera House on 2 Union St., the Speak Up NH: Changing the way we talk about addiction in the North Country panel event will run from 5:00 – 7:00 p.m. on Wednesday, February 15, 2017. This free event is open to all, including community members and leaders interested to be a part of the rallying cry to change the way we think and talk about addiction as a community. For more information or to register to attend the Speak Up NH panel session in Littleton, go to: http://www.nchcnh.org/health_wellness.php or contact Anna at North Country Health Consortium: ashum@nchcnh.org or (603) 259-3700 x257. The North Country Health Consortium (NCHC) is playing a key role in leading Northern NH to transform its behavioral health system in a 5-year $150 million statewide initiative. As the Administrative Lead representing Coos, northern Grafton, and Carroll Counties in the program, NCHC together with a network of local partners will work to change the way physical and behavioral health care are delivered to Medicaid beneficiaries with behavioral health conditions, including substance misuse disorders, and other co-occurring chronic health issues. On January 5th this year, the state of New Hampshire received approval from the Centers for Medicare and Medicaid Services (CMS) to access new federal funding under a Section 1115(a) Waiver, known as “Building Capacity for Transformation.” Also referred to as a Delivery System Reform Incentive Program (DSRIP), this initiative paved the way for 7 state-proposed Integrated Delivery Networks (IDN) to form and cover the state. Each regionally-based IDN is made up of a broad range of physical and behavioral health providers, and community-based organizations that have agreed to work in collaboration and integrate services with sights on improving access to behavioral care and reducing avoidable hospital use, while lowering health care costs. 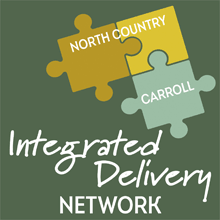 Partners working together in Coos, northern Grafton, and Carroll Counties, including Administrative Lead, NCHC, make up the Region 7 IDN. The goal of the statewide incentive program is to better support Medicaid recipients by tasking IDNs with multiple aims: integrating physical and behavioral health care, expanding capacity of the behavioral health workforce, and reducing gaps in care through coordination across providers and linking Medicaid beneficiaries with community supports. In order to receive its share of up to $30 million per year over the next 5 years, each IDN must collectively achieve predetermined measures for system transformation, clinical care, and population health during semi-annual reporting cycles. Funding allotted to each of the 7 networks was determined in proportion to Medicaid beneficiaries in the given service area. In the first year of DSRIP, North Country Health Consortium has received an initial $2.4 million on behalf of Region 7 IDN to build capacity for workforce and develop an information technology infrastructure that allows providers across its network to share health records and communicate in real time. The North Country Health Consortium is a non-profit rural health agency based in Littleton that collaborates with health and human services providers serving northern New Hampshire. For more information about the Region 7 IDN, contact April Allin, IDN Program Manager at aallin@nchcnh.org or call (603) 259-3700 x220. To learn more about NCHC, visit: www.nchcnh.org. North Country Health Consortium (NCHC) partnered with Hope for New Hampshire Recovery in Berlin and White Mountains Community College (WMCC) to host an educational community event centered on substance misuse and addiction, including training of the group in the administration of the overdose-reversal drug, Naloxone, and viewing of The Anonymous People, a documentary featuring stories from people amongst the 23.5 million Americans living in long-term recovery from drug and alcohol addiction. The November 9th event at WMCC in Berlin brought together a diverse group, including Berlin Hope’s own Recovery Coach Volunteers, staff of Northern Human Services, WMCC students, and members of the greater community. Enman’s wishes to expand training and access to Naloxone echo those recently expressed by Dr. Vivek Murthy in the new Surgeon General’s report on alcohol, drugs, and health, “Facing Addiction in America,” issued last month. Marking the first time in which a Surgeon General defines substance use disorders as a disease, the report calls on the nation to help address the current opioid crisis, including changing our attitudes about addiction and supporting harm reduction strategies like Naloxone to give drug users a chance to get help when they are ready. Acting in cooperation with the NH Department of Health and Human Services, NCHC provides trainings to organizations and communities for administering Naloxone. Training participants are provided with a free Naloxone kit - also known as Narcan - upon completion. In the past year, NCHC has trained school groups and hospital staff, in addition to broader community members at public events, such as the annual North Country Moose Festival in August 2016. Last spring, NCHC partnered with the Black Crow Project and the Lancaster Rialto Theater to host the public awareness forum, “Heroin in the North Country.” With 145 life-saving kits issued to attendees, this forum was the largest Naloxone distribution event in the state to date. North Country Health Consortium is a non-profit rural health agency based in Littleton that collaborates with health and human services providers in northern New Hampshire. For more information about scheduling Naloxone administration training for your group, community, or at your next event, contact Amy Jeroy, NCHC Public Health Director at ajeroy@nchcnh.org or call (603) 259-3700 x228. To learn more about NCHC, visit: www.nchcnh.org. Please join us on Monday, November 14, 2016 from 8:30am-1:00pm at the Mountain View Grand Resort and Spa in Whitefield, NH! The Northern New Hampshire Area Health Education Center, a program of the North Country Health Consortium (NCHC), has closed another successful summer of Middle School STEM-Health Career Summer Camps. The STEM-Health Career Summer Camp is designed to provide students with an interactive, local opportunity to explore a vast array of health careers. Participating in this fun, hands-on experience allows students to experience different health professions, with the hope that they may be further encouraged to pursue a health career. Each summer, NCHC partners with the Hugh J. Gallen Career and Technical Center in Littleton and the White Mountains Community College in Berlin to offer this experience to middle school-aged students in the North Country. Marking the 7th year for the week-long health career summer camps, 2016's two STEM camps hosted a total of 39 participating youth. "The STEM-Health Career Summer Camps are a fun way to introduce middle school students to the many career opportunities available in the healthcare field, everything from nursing and dentistry, to veterinary medicine and biotechnology," said Nancy Frank, Executive Director of North Country Health Consortium. "In the past 7 years that we've offered them, the camps have been well received by our campers and the community, so we're looking forward to next summer, and keeping up this initiative." The Berlin camp was held the week of June 20-24, where 21 students were in attendance. NCHC was pleased to welcome to camp the Weeks Medical Center's Northwoods Center for Continuing Education of Whitefield and RizFit Fitness Coaching of Lancaster, amongst other new and returning camp presenters. Northwoods provided first-aid and CPR education, while RizFit offered a health and wellness segment to students at the Berlin Camp. Other items on the week's agenda included activities around veterinary medicine, rocket building, science with the Portsmouth Naval Shipyard, oral health with NCHC's Molar Express, and a field trip to the Berlin Fish Hatchery. The Littleton camp was held the week of July 11-15 at the Hugh J. Gallen Career and Technical Center. During the week, 18 campers utilized the state-of-the-art medical training facility, including "SimMan"- a life-like simulator that tasks students with controlling all of the dummy's vitals and even talking for him, while another group administers CPR and other life-saving measures. Other activities of the Littleton camp included: intubating different SimMan models, ranging from infant- to adult-sized; inserting IVs into a training arm; creating clay replicas of the human anatomy; learning about emergency medical services with CALEX Ambulance Service; using a high-tech dental simulator for oral health training activities with the Molar Express; triaging during simulated mass casualty situations; and blood typing. Graciously welcoming campers for the last four summers, Littleton Regional Healthcare (LRH) wrapped up the camp week giving a full tour of its facility to the group of young medical career prospects. NCHC would like to thank all supporters, presenters, and contributors of the STEM-Health Career Summer Camps. Without the collaboration of North Country healthcare organizations, this opportunity and rich experience for students to explore the health field would not have been possible. NCHC would again like to thank Weeks Medical Center's Northwoods Center for Continuing Education, RizFit Fitness Coaching, Littleton Regional Healthcare, CALEX Ambulance Service, and the Portsmouth Naval Shipyard. NCHC is a rural health network based in Littleton that collaborates with health and human service providers serving northern New Hampshire. To learn more about the STEM-Health Career Summer Camps, visit nchcnh.org or call Diana Gibbs, NCHC Program Manager, at (603) 259-3700 ext. 222. HAVERHILL- On August 5-6, the New Hampshire Department of Health and Human Services (DHHS) sponsored a public health emergency exercise that played out a large-scale infectious disease outbreak affecting multiple regions throughout the state. Slated to test each region's plans to deliver medication to the community- and ability to communicate and work in tandem with Federal, State, and local emergency response personnel and systems in the event of an actual emergency- this preparedness drill saw participation from each of New Hampshire's 13 Public Health Networks. Serving all of Northern Grafton and Coos Counties- and hosted by the North Country Health Consortium, based in Littleton- the North Country Public Health Network assumed their emergency response roles and training activities at the Grafton County Complex and the Haverhill Cooperative Middle School, in North Haverhill on the 5th and 6th, respectively. "I believe that it was important to come together, as a state and a region, to play out the protocols standardized for large-scale public health emergencies," commented, Amy Jeroy, Public Health Coordinator of the North Country Public Health Region, "because we don't want these basic steps to feel novel in the case of an actual event." In the event of an infectious disease outbreak, North Country residents would be notified about a Point of Dispensing (POD) site to which they would report should treatment be required. For this part of the emergency exercise in the North Country, Haverhill Cooperative Middle School housed the simulated POD activities, including staging: a landing zone on campus to receive a Black Hawk helicopter transporting the NH National Guard with the Strategic National Stockpile (SNS) supply of medications and vaccinations for distribution; and space to host medical providers, response and administrative staff, security personnel, the media, and crowd of community volunteers standing in as patients being triaged for treatment. While Saturday's events at the Haverhill Cooperative Middle School were the more visible, Friday's behind-the-scenes activities marked the official start of the drill. That Friday morning, the Center for Disease Control and Prevention (CDC) transmitted the first alert to all 13 NH Public Health Networks via the Health Alert Network- or HAN- the nationally shared, integrated electronic information and communication system. Receiving the call, Jeroy, assembled the command team at the Grafton County Complex, which served as the stand-in command post. Stationed at the Grafton Complex, collaborating expertise and coordinating response activities, the command team tracked the simulated emergency through HAN as it unfolded throughout the day; and in a series of communications with State and Federal entities, deployed a SNS of emergency medical supplies for next-morning delivery to the Haverhill Cooperative Middle School to be inventoried, administered to patients, and re-inventoried before getting packed and airlifted back to one of the unidentified SNS storage sites scattered throughout the country. After the large-scale SNS exercise spanning two days and two sites in the North Country, Jeroy reflected on the experience. "I am proud of the North Country for the job we all did in this statewide exercise," she shared, commending her team, including all participating local responders and partners. "Since the drill," Jeroy continued, "the Public Health team has already met to further refine our processes, which would not have been possible without the insight gained from our active participation in the drill. As a region of small communities, the North Country has to resist the notion that large-scale emergencies just don't happen here. No matter how unlikely they are, we must be prepared for incidents, big and small. That example starts with our Public Health system." 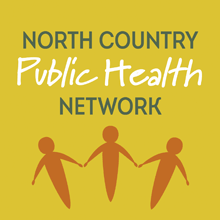 Home to the North Country Region Public Health Network, North Country Health Consortium (NCHC) is a non-profit rural health agency based in Littleton that collaborates with health and human services providers serving northern New Hampshire. To learn more about the PODs in your region, opportunities to volunteer at upcoming POD emergency preparedness trainings, or other NCHC programs and services, visit www.nchcnh.org, or call Amy Jeroy at (603) 259-3700. North Country- The Community Health Needs Assessment (CHNA) process is underway throughout Coos and Northern Grafton counties. All community members are encouraged to participate in the survey, which is open to residents of the North Country, including Berlin, Colebrook, Lancaster, Littleton, and all surrounding towns. The survey asks people to report their experiences and opinions on different aspects of health and well-being in their community and will take about 10 minutes to complete. The Community Health Needs Assessment is conducted by the North Country Health Consortium (NCHC) in collaboration with the North Country Healthcare system: Androscoggin Valley Hospital, Littleton Regional Healthcare, Upper Connecticut Valley Hospital, and Weeks Medical Center. "The Community Health Needs Assessment relies on the voices of the people who live here to understand the circumstances that affect health," says Nancy Frank, NCHC Executive Director. "Because survey results are used to inform and strengthen the programs, services, and care that collectively make North Country communities healthy, it is so important to hear from as many people as possible, so the needs of the whole community are represented." The purpose of the CHNA is to gather information about the overall status, concerns, unmet needs, and suggestions for improvement in regards to health in the North Country communities. Results from the CHNA survey will help North Country hospitals and health and human services leaders understand and identify the areas of opportunity for their organizations that represent the most pressing health needs of the communities that they serve. If you live in the North Country, we urge you to participate. The opportunity to complete the Community Health Needs Assessment survey will close at the end of August. You can access the survey online with this link: http://bit.ly/CommunityNeeds2016. Paper versions of the survey will also be available at your local North Country hospital, select locations throughout your community, or by contacting Diana Gibbs at North Country Health Consortium: (603) 259-3700, ext. 222. NCHC is a rural health network based in Littleton that collaborates with health and human service providers serving northern New Hampshire. To learn more about the Community Health Needs Assessment or NCHC programs and services in your community, visit www.nchcnh.org or call (603) 259-3700. WHITEFIELD- The 5th Annual North Country Health Improvement Summit, hosted by the North Country Health Consortium (NCHC), gathered on June 9, 2016 at the Mountain View Grand Resort and Spa in Whitefield. Representing Health professionals, government officials, local business and community members from across the state, summit participants came together around the theme and common vision of "Embracing a Culture of Wellness." "I think it is important to understand that many critical indicators are used to rank health outcomes and determine that health factors are moving in the right direction," said Nancy Frank, Executive Director of the North Country Health Consortium. Addressing the group during her opening remarks, Frank pointed out the positive strides in Coos County since NCHC's initial Health Improvement Summit in 2011, including: a 5 percent decrease in adult smoking; a nearly 1 percent and 3 percent drop, respectively, of adults who reported poor physical health days and physical inactivity; and a 26 percent rise in adults' reports of access to exercise opportunities. Delivering the keynote address, Rebecca Busanich, PhD, Assistant Professor and Associate Director of the Center for Active Living and Healthy Communities at Plymouth State University, discussed, "The Weight We All Carry: Resisting Cultural Narratives Around Body Weight to Improve Health and Well-being." Dr. Busanich argued that the current focus on weight, and on health as a collection of numbers, is a narrow lens with which to consider obesity. What's more, the culture's obsession and negative language attached to weight, food, and physical activity hurts the cause. In closing, Busanich asked the audience to challenge the way they think and talk about health- and "run for joy," as she put it- to focus on positive health behaviors. The presentation lineup continued to paint the big picture of health, including the importance of cultural, social, and environmental influences on individuals and communities, also known as "Social Determinants of Health." Ashley Conley, MS, Epidemiologist for the Nashua Public Health Department, described how conditions in which people grow, live, work, and play affect a population's health. Since individual communities have conditions distinct to their region and people, it is crucial to understand the unique needs of a population when working towards positive changes for health and well-being. Closing sessions wrapping up the Summit offered tips and resources for breaking up desk time with physical activity; asthma management education for health providers; worksite wellness best-practices to improve employee health; and tools to plan and start a personal wellness journey. "We all have been working hard to improve health outcomes in the region," praised Frank, "but we still have work to do." Collaboration is key to continuing this positive momentum. The North Country Health Consortium extends an invitation to anyone interested to join the North Country Health Improvement Working Group- a collaboration of health professionals, local business and community members, and others dedicated to the health of the North Country. NCHC is a rural health network based in Littleton that collaborates with health and human service providers serving northern New Hampshire. To join the North Country Health Improvement Working Group and to learn more about NCHC, visit www.nchcnh.org or call (603) 259-3700. LITTLETON- The North Country Health Consortium (NCHC) assembled emergency preparedness kits to be given to community members for use in case of emergencies or disasters. As the home of the North Country Public Health Network (NCPHN), which serves Northern Grafton and Coos counties, NCHC collaborates with local health systems to increase health status and ensure the safety of North Country residents. NCHC partners with local communities and residents to: prepare for emergencies, access healthcare, provide healthcare professional and community-based education, as well as oral healthcare services, and prevent and address substance misuse disorders. "We wanted to tie the public health work that we do every day directly with service to our local communities," says Nancy Frank, Executive Director of NCHC. "Making these kits was an opportunity for us to give back to the community, while connecting our efforts with other local organizations that do great work, like Granite State Independent Living." North Country Health Consortium received generous donations from Home Depot and Walmart of Littleton, Shaws in Lancaster, and Staples to stock utility buckets with essential items, such as water, first-aid kits, and materials outlining emergency protocols. The emergency preparedness kits will be distributed to area residents through Granite State Independent Living (GSIL). "Granite State Independent Living provides support to seniors and consumers with disabilities to live their lives as independently as they choose," says Donna Potter, Director of Home Care North at Granite State Independent Living. "The emergency preparedness kits provided by the generosity of North Country Health Consortium will go a long way to assist GSIL consumers, many of whom are unable to leave their homes, in maintaining their independence." NCHC is a rural health network based in Littleton that collaborates with health and human service providers serving northern New Hampshire. Learn more at www.nchcnh.org or call (603) 259-3700. Please join us for the 5th Annual North Country Health Improvement Summit for an energizing day filled with opportunities to connect with and learn from others about health in the North Country! The goal of the Summit is to provide practitioners and leaders updates and resources available that foster health improvement in the North Country. The Summit will provide tools for improving health at the personal, professional, organizational, and policy levels. White Mountains Community College President Matt Wood welcomed Governor Hassan to the North Country on Friday, March 25. Governor Hassan unveiled the new "Gateway to Work" initiative in partnership with the New Hampshire Community College System that will begin in the summer of 2016. The Gateway to Work initiative will repurpose federal funding to provide supports for individuals to reduce barriers to gainful employment, such as transportation, job skills, etc. North Country Health Consortium Executive Director, Nancy Frank, succeeded Gov. Hassan to discuss current Northern NH Area Health Education Center (NNH AHEC) workforce development initiatives, including the North Country Health Career Initiative Program. 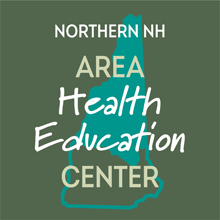 In 2015, the NNH AHEC- a program of the North Country Health Consortium- was fortunate to secure federal funding to provide direct scholarship support to economically or educationally disadvantaged residents to complete allied health training programs through the White Mountains Community College (WMCC). This collaboration with WMCC has created obtainable training opportunities for students to enter Licensed Nursing Assistant, Medication Nursing Assistant, and Health and Wellness Advocate Certificate training programs. Programs such as Gateway to Work and the North Country Health Career Initiative Program create further supports to ensure that a well-trained workforce exists in Northern NH communities. To learn more about the North Country Health Career Initiative Program, contact Diana Gibbs at dgibbs@nchcnh.org or call (603) 259-3700 ext. 222. NCHC's Quality Improvement Program Recognized at the Federal Level! Are you interested in becoming an Allied Health Professional? North Country Health Consortium is proud to host the annual Youth Leadership Through Adventure high school conference. Involving almost every high school in the North Country and involving upwards of 100 participants, this three day leadearship and skills building experience will ready the Youth Leadership groups to lead change back at their schools. Littleton, NH - The North Country Health Consortium is a partner in one of the 39 health care collaborative networks selected to participate in the Transforming Clinical Practice Initiative, announced by Health and Human Services Secretary Sylvia M. Burwell. 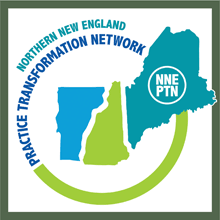 The Northern New England Practice Transformation Network is a partnership between the New Hampshire Citizens Health Initiative at the University of New Hampshire Institute for Health Policy and Practice, Maine Quality Counts, and Vermont Program for Quality in Healthcare, Inc. In New Hampshire, the Practice Transformation Network will be led through the NH Citizens Health Initiative at the University of New Hampshire's Institute for Health Policy and Practice. "We are very excited to be able to provide NH's medical practices with practical assistance to help them respond to the changing health care payment and practice environment and better serve their patients' needs," said Jeanne Ryer, Director of the NH Citizens Health Initiative. The Citizens Health Initiative will connect Practice Transformation Network activities to its Accountable Care Project learning network and work with key partner North Country Health Consortium to provide health practices around the state with Practice Transformation Coaches. Coaches will assess individual practice needs and provide technical assistance to enhance patient care, improve care coordination and quality outcomes, and lower costs. "We are thrilled to be a partner in this important initiative and to work with practices throughout the state. We will be working at the community level to ensure patient and clinician needs are being met as we move New Hampshire forward toward better health," said Nancy Frank, Executive Director of the North Country Health Consortium. The North Country Health Consortium (NCHC) is a rural public health organization whose mission is to improve the health status of North Country residents. NCHC will be working with the statewide Area Health Education Center (AHEC) program to provide a network of Practice Transformation Coaches at the community level. "Having worked with CHI on both the patient centered medical home and accountable care project efforts in my role as CEO of Ammonoosuc Community Health Services, as well as a Board Director at NCHC on efforts including the North Country Accountable Care Organization, I am pleased to see this investment in CHI and NCHC as it will once again demonstrate how New Hampshire is first in the nation in moving health care reform forward," said Ed Shanshala. The Northern New England Practice Transformation Network will support 500 primary care and specialist practices to expand their quality improvement capacity, learn from one another, and achieve common goals of improved care, better health, and reduced cost. The network will conduct a readiness assessment for each practice; provide direct technical assistance through the network of practice "coaches"; offer a range of options and opportunities for regional and cutting-edge distance-based collaborative learning; provide evidence-based team trainings; and build networking and tools to improve care coordination across the participating practices. These awards are part of a comprehensive strategy advanced by the Affordable Care Act that enables new levels of coordination, continuity, and integration of care, while transitioning volume-driven systems to value-based, patient-centered, health care services. It builds upon successful models and programs such as the Hospital Value-Based Purchasing Organization Program, Partnership for Patients with Hospital Engagement Networks, and Accountable Care Organizations.